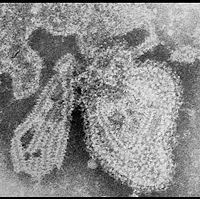 TEM micrograph of the mumps virus. Mumps, or epidemic parotitis, is an acute, very contagious, inflammatory viral infection caused by a paramyxovirus (mumps virus) and typically characterized by swelling of the salivary glands and, particularly, the parotid glands (parotitis) (salivary glands near the ear). This infection is only known to occur naturally in humans (Breslow 2002). While not as contagious as chickenpox or measles (Longe 2006), mumps used to be a very common childhood disease and it is still a significant threat to health in the third world (Kasper et al. 2004). Human creativity has developed a very effective vaccine that has greatly reduced incidences of this disease in the developed world. Once a person has had mumps, he or she becomes immune to the disease. The mumps vaccine used in the United States, which also confers long-lasting immunity, was licensed in December 1967 (Breslow 2002). Mumps is caused by a paramyxovirus, which is any virus of the Paramyxoviridae family of the Mononegavirales order. They are negative-sense single-stranded RNA viruses responsible for a number of human and animal diseases. The most typical presentation of mumps is painful swelling of the salivary glands (classically the parotid gland) and fever (Enders 1996). 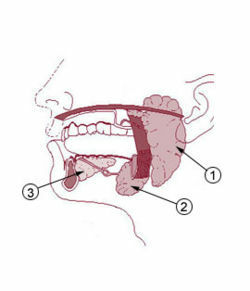 The salivary glands in mammals are exocrine glands that produce saliva and include the parotid gland, the submandibular gland, and the sublingual gland. The parotid gland is the largest of the salivary glands. It is found in the subcutaneous tissue of the face, overlying the mandibular ramus and anterior and inferior to the external ear. It secretes saliva through Stensen's duct into the oral cavity, to facilitate mastication and swallowing. Typically in mumps, there is swelling in both cheek areas, but there also may not be any swelling or swelling on just one side (Longe 2006). Because inflammation of the parotid glands is particularly common, the disease also is called epidemic parotitis. Swelling of other tissues or organs may also occur where the virus occurs, such as the scrotum (inflammation of the scrotum is known as orchitis), ovaries (oophoritis), and pancreas (pancreatitis). There can be extreme pain due to the testicles being inflamed, whereas inflammation of the ovaries tends to be less painful. Highly infectious, prior to the development of a vaccine mumps was vary common among children, with most children contracting mumps between the ages of four and seven (Longe 2006). In the United States, about 92 percent of all children had been exposed to the infection by the age of 15 (Longe 2005). While symptoms are generally not severe in children, the symptoms in teenagers and adults can be more severe, and complications such as infertility or subfertility are relatively common, although still rare in absolute terms (Preveden et al. 1996; Shakhov and Krupin 1990; Tsvetkov 1990). In the United States in 1967, mumps accounted for approximately one-third of encephalitis cases and one person in 20,000 cases died (Breslow 2002). The disease is generally self-limited, running its course before waning, with no specific treatment apart from controlling the symptoms with painkillers. The mumps virus was identified in 1934, and by 1948, a killed virus vaccine was licensed, but later discontinued because of its failure to produce long-lasting immunity (Breslow 2002). The current mumps vaccine used in the United States is a live, attenuated vaccine, the Jeryl-Lynn strain, and was licensed in December of 1967 (Breslow 2002). In the United States, mumps vaccine is commonly administered to children as part of the MMR vaccine (measles, mumps, rubella). Another strain is commonly administered in many developing nations. The paramyxovirus that causes mumps is prevalent in the saliva, and is spread from person to person by saliva droplets or direct contact with articles that have been contaminated with infected saliva. The parotid glands usually are involved. Unvaccinated children between the ages of 2 and 12 are most commonly infected, but the infection can occur in other age groups. Orchitis (swelling of the testes) occurs in 10–20 percent of infected males, but sterility only rarely ensues; a viral meningitis occurs in about 5 percent of those infected. In older people, the central nervous system, the pancreas, the prostate, the breasts, and other organs may be involved. The incubation period is usually 18 to 21 days, but may range from as few as 12 to as many as 35 days (Enders 1996). Mumps is generally a mild illness in children in developed countries. After adolescence, mumps tends to affect the ovary, causing oophoritis, and the testes, causing orchitis. The mature testis is particularly susceptible to damage from mumps, which can lead to infertility. Adults infected with mumps are more likely to develop severe symptoms and complications. Swelling of the parotid gland (or parotitis) in more than 90 percent of patients on one side (unilateral) or both sides (bilateral), and pain behind the lower jaw when chewing. Orchitis, referring to painful inflammation of the testicle (Manson 1990). Males past puberty who develop mumps have a 30 percent risk of orchitis. Other symptoms of mumps can include sore face and/or ears, loss of appetite, lack of energy, and occasionally in more serious cases, loss of voice. Generally, the first symptoms are chills, headache, loss of appetite, and loss of energy, while swelling of the salivary glands occurs within 12-24 hours of the above symptoms (Longe 2006). There often is pain on chewing or swallowing in cases of the glands being swollen, which is particularly pronounced in the case of drinking acidic beverages (Longe 2006). The fever may be as high as 104 degrees Fahrenheit. A physical examination confirms the presence of the swollen glands. Usually the disease is diagnosed on clinical grounds and no confirmatory laboratory testing is needed. This is particularly easy to diagnose when the disease is at epidemic levels, but in countries where many people are vaccinated against the infection, the physician may look for other causes of the swollen glands. If there is uncertainty about the diagnosis, a test of saliva, urine, blood, or spinal fluid may be carried out; a newer diagnostic confirmation, using real-time nested polymerase chain reaction (PCR) technology, has also been developed (Krause et al. 2006). An estimated 20-30 percent of cases are asymptomatic (CDC 2006). There is no specific treatment for mumps. Because it tends to be mild, it usually is allowed to run its course, but the symptoms may be treated. Symptoms may be relieved by the application of intermittent ice or heat to the affected neck area and by Acetaminophen/Paracetamol (Tylenol) for pain relief. Aspirin use is discouraged in young children because of studies showing an increased risk of Reye's syndrome. It is important that the individual be kept hydrated, which is challenging due to the discomfort of swallowing. Warm salt water gargles, soft foods, and extra fluids may be used, while patients are advised to avoid fruit juice or any acidic foods, since these stimulate the salivary glands, which can be painful. If orchitis occurs, a physician should be consulted and pain can be lessoned by supporting the scrotum in a cotton bed on an adhesive-tape bridge (Longe 2006). Acupressure can be used to relieve pain in the swollen glands, and there are a number of nutritional, homeopathic, and herbal remedies that may be used (Longe 2005). These include using belladonna for treating flushing, redness, and swelling, bryonia (wild hops) for irritability, lack of energy, or thirst, phytolacca (poke root) for extremely swollen glands, and echinacea and multivitamins to boost the immune system. A research group published a 1996 report on a chemical extracted from Spirulina platensis, a species of blue-green algae, which inhibited Mumps virus in a viral plaque assay (Hayashi et al. 1996). A University of Tokyo group reported in 1992, that research compound TJ13025 ((6'R)-6'-C-methylneplanocin A) had an antiviral effect on four Mumps virus strains cultured in Vero cells. Additional research improved the synthesis of a particular isomer, RMNPA, of TJ13025 from the racemic product (Shuto et al. 1997; Shuto et al. 2002). A 2005 publication in a Russian journal reports that Myramistin has antiviral activity against Mumps virus in Vero cells culture (Agafonov et al. 2005). Death is very unusual. The disease is self-limiting, and general outcome is good, even if other organs are involved. Sterility in men from involvement of the testes is very rare. Unlike measles, birth defects are not associated with mumps infection during pregnancy, although there is a greater incidence of fetal death associated with infections during the first trimester (Breslow 2002). After the illness, life-long immunity to mumps generally occurs. Known complications of mumps include infection of other organ systems (meningitis, mastitis, orchitis, pancreatitis, arthritis, thryoiditis, neuritis, pericarditis, and deafness), sterility in men (this is quite rare, and mostly occurs in older men), mild forms of meningitis, and encephalitis (Breslow 2002). The mumps infection can spread to the brain and cause encephalitis (inflammation of the brain), and only about 1 in 100 with mumps encephalitis dies from the complication (Longe 2006). There may be profound (91 dB or more), but rare, sensorineural hearing loss, uni- or bilateral. The most common preventative measure against mumps is immunization with a mumps vaccine. The vaccine may be given separately or as part of the MMR immunization vaccine, which also protects against measles and rubella. In the United States, MMR is now being supplanted by MMRV, which adds protection against chickenpox. The World Health Organization (WHO) recommends the use of mumps vaccines in all countries with well-functioning childhood vaccination programs. In the United Kingdom, it is routinely given to children at age 15 months. The American Academy of Pediatrics recommends the routine administration of MMR vaccine at ages 12-15 months and at 4-6 years. In some locations, the vaccine is given again between 4 to 6 years of age, or between 11 and 12 years, of age if not previously given. Efficacy of the vaccine depends on the strain of the vaccine, but is usually around 80 percent (Schlegel et al. 1999). The Jeryl Lynn strain is most commonly used in developed countries, but has been shown to have reduced efficacy in epidemic situations. The Leningrad-Zagreb strain is commonly used in developing countries, but appears to have superior efficacy in epidemic situations (Peltola et al. 2007). Some anti-vaccine activists protest against the administration of a vaccine against mumps, claiming that the attenuated vaccine strain is harmful, and/or that the wild disease is beneficial. Disagreeing, the WHO, the American Academy of Pediatrics, the Advisory Committee on Immunization Practices of the Centers for Disease Control and Prevention, the American Academy of Family Physicians, the British Medical Association, and the Royal Pharmaceutical Society of Great Britain currently recommend routine vaccination of children against mumps. The British Medical Association and Royal Pharmaceutical Society of Great Britain had previously recommended against general mumps vaccination, changing that recommendation in 1987. In 1988, it became United Kingdom government policy to introduce mass child mumps vaccination programs with the MMR vaccine, and MMR vaccine is now routinely administered in the UK. Before the introduction of the mumps vaccine, the mumps virus was the leading cause of viral meningoencephalitis in the United States. However, encephalitis occurs rarely (less than 2 per 100,000) (Atkinson et al. 2006). In one of the largest studies in the literature, the most common symptoms of mumps meningoencephalitis were found to be fever (97 percent), vomiting (94 percent), and headache (88.8 percent) (Kanra et al. 2004). The mumps vaccine was introduced into the United States in December 1967: since its introduction there has been a steady decrease in the incidence of mumps and mumps virus infection. There were 151,209 cases of mumps reported in 1968; in 1998 there were only 666 cases reported. Longe (2006) notes the greatest mumps epidemic was in 1941, when there were 250 cases for every 100,000 people, and that this was reduced to 76 cases for every 100,000 people in 1968, (the year after the vaccine was introduced); by 1995, there were less than 1 case for every 100,000 people (or 3,000 cases of mumps). Original version based on the National Library of Medicine's Medline Plus website. Update Date: August 15, 2001. Update date included for cross-reference against newer versions. Agafonov, A. P., G. M. Ignat'ev, V. V. Svistov, I. V. Smirnov, and I. S. Krivoshein. 2005. In vitro study of antiviral activity of Myramistin against measles and mumps viruses. Antibiot Khimioter 50(5-6): 17-19. Atkinson, W., S. Humiston, C. Wolfe, and R. Nelson, eds. 2006. Epidemiology and Prevention of Vaccine-Preventable Diseases.. Centers for Disease Control and Prevention. Retrieved October 7, 2007. Centers for Disease Control and Prevention (CDC). 2006. Mumps epidemic: Iowa 2006. Morbidity and Mortality Weekly Report. Retrieved October 7, 2007. Hayashi, T., K. Hayashi, M. Maeda, and I. Kojima. 1996. Calcium spirulan, an inhibitor of enveloped virus replication, from a blue-green alga Spirulina platensis. J Nat Prod 59(1): 83-87. Kanra, G., P. Isik, A. Kara, A. B. Cengiz, G. Secmeer, and M. Ceyhan. 2004. Complementary findings in clinical and epidemiologic features of mumps and mumps meningoencephalitis in children without mumps vaccination. Pediatr Int 46(6): 663-668. Krause, C. H., K. Eastick, and M. M. Ogilvie. 2006. Real-time PCR for mumps diagnosis on clinical specimens—comparison with results of conventional methods of virus detection and nested PCR. J Clin Virol. 37(3): 184-189. Manson, A. L. 1990. Mumps orchitis. Urology 36(4): 355-358. Peltola, H., P. S. Kulkarni, S. V. Kapre, M. Paunio, S. S. Jadhav, and R. M. Dhere. 2007. in Canada and the United States: Time for new thinking on mumps vaccines. Clin Infect Dis 45: 459-466. Retrieved October 7, 2007. Preveden, T., J. Jovanovic, and D. Ristic. 1996. Fertility in men after mumps infection without manifestations of orchitis. Med Pregl 49(3-4): 99-102. Schlegel, M., J. J. Osterwalder, R. L. Galeazzi, and P. L. Vernazza. 1999. Comparative efficacy of three mumps vaccines during disease outbreak in Eastern Switzerland: cohort study. BMJ 319(7206): 352. Retrieved April 18, 2006. Shakhov, E. V., and V. N. Krupin. 1990. The clinico-statistical characteristics of the testicular generative function in male subfertility following mumps. Urol Nefrol (Mosk) 2: 46-50. Shuto, S., T. Obara, S. Yaginuma, and A. Matsuda. 1997. New neplanocin analogues. IX. A practical preparation of (6'R)-6'-C-methylneplanocin A (RMNPA), a potent antiviral eileen, and the determination of its 6'-configuration. Diastereoselective deamination by adenosine deaminase. Chem Pharm Bull (Tokyo) 45(1): 138-142. Shuto, S., N. Minakawa, S. Niizuma, H. S. Kim, Y. Wataya, and A. Matsuda. 2002. New neplanocin analogues. 12. Alternative synthesis and antimalarial effect of (6'R)-6'-C-methylneplanocin A, a potent AdoHcy hydrolase inhibitor. J Med Chem 45(3): 748-751. Tsvetkov, D. 1990. Spermatological disorders in patients with postmumps orchitis. Akush Ginekol (Sofiia) 29(6); 46-49. World Health Organization: "Immunization, Vaccines and Biologicals: Mumps vaccine". Collection of information from the Centers for Disease Control and Prevention concerning mumps.